ProTec helps you enhance and improve the performance of your Alterrex excitation systems with a retrofitted air-cooled bridge rectifier that exceeds OEM replacement alternatives. Refurbished switches can be installed at the customer’s request. The refurbished switches will be installed and exchanged with the old switches. The new switches are 5 pole manual or motor operated disconnect switches. The monitoring panel is retrofitted with an electronic Kirk-Key interlock switch for operation of the disconnect switch with the doors closed. The control switches can also be remotely mounted if the customer requires. The advantage of the new switch is to lower the NFPA 70E Arc Flash Protection requirement during switch operation. Eliminates corrosion, pipe blockages and water leaks, copper tracking, erosion and isolation valve failures to save on maintenance costs. Provides the option of thermostat-controlled back-up fans for added protection. Provides the option of individual fuse status indicating lights. Provides the option of changing heat sink RTD relays to RTD transmitters for monitoring heat sink temperatures. New five pole manual or motor operated disconnect switches. Allows for the option of keeping existing switches to eliminate unnecessary replacement. Maintains the Kirk Key Interlock by maintaining the original switches. Increases the current carrying capacity from 1600 Amp to 2000 Amp. Includes heat sink fans for emergency cooling. Replaces individual fuses with three AC line fuses for better coordination. Designed for drop-in replacement for ease of installation. Replaces 24 diode design with 6 diode design. 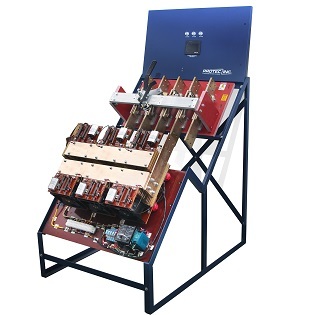 Includes field-serviceable diode bridge assemblies. 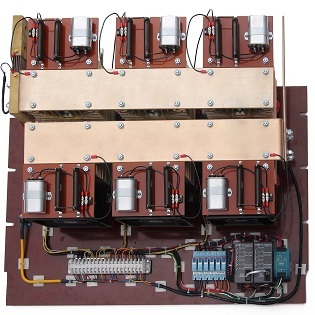 Includes heat sink RTDs wired to RTD relays for monitoring or alarm. ProTec helps you enhance and improve the performance of your Alterrex excitation systems with a retrofitted air-cooled rectifier that exceeds OEM replacement alternatives. The ProTec’s Air Bridge 2000 ™ (air bridge rectifiers) is a drop-in replacement for the aging water-cooled diode bridge, commonly found in Alterrex Excitation Systems. The ProTec Air Bridge 2000 uses a convection-cooled process and does not require the cooling water of the Alterrex system. In addition, this bridge retrofit mounts in the same back-plane as the original rectifier. The ProTec Air Bridge 2000 ™ is a form, fit and function replacement for the bridge rectifier portion only of the Alterrex excitation system. The Air Bridge 2000 ™ eliminates the need for cooling water and eliminates the maintenance, reliability and safety issues associated with cooling water on bridge rectifiers. The disconnect switches for the water-cooled rectifiers are another item that does not get much maintenance attention. Typically the 5-pole disconnect switches also have problems, and need to be refurbished and/or replaced. The ProTec Air Bridge 2000 is a three-phase, six-diode convection-cooled rectifier bridge. The original Alterrex designs used as many as 24 diodes to accomplish the same ratings. While the original bridge had a rating of 1200 -1600 ADC, ProTec Air Bridge 2000 ™ features 2000 ADC convection in a 50°C ambient temperature. Heat sink fans are also included and controlled by heat sink RTD’s and thermostats for instances when the temperatures are high enough to cause the lifecycle of the diode to be degraded. The value of a ProTec Air Bridge 2000 ™ retrofit includes the economical resolution to problematic water-cooled systems, a higher current carrying capacity and our unique drop-in design means shorter outage duration that leads to increased availability. In addition, all ProTec Air Bridge 2000 ™ retrofits also offer valuable benefits for our customers—including enhanced functionality, ease of use and minimal installation cost. Each diode in the ProTec Air Bridge 2000 ™ is mounted between two high efficiency heat sinks designed specifically for the application. The heat sink clamp is pre-calibrated and has a force indicator. In addition, AC line fuses are also included in the ProTec Air Bridge 2000 ™ and have been specifically selected to provide steady-state, short circuit and I2T protection of the diodes. The I2T was specifically chosen to allow the fuses to clear before damage to the diode occurs. Blown fuse indicators on the bridge rectifier are wired to a terminal for remote monitoring. One 2000 Amp, 50 mV shunt is provided. The 50 mV outputs are wired to terminals for remote monitoring. Thermostats for controlling the heat sink fans and Resistive Temperature Detectors (RTD’s) are wired to terminals for remote monitoring. The Air-Bridge 2000 ™ was designed for ease of installation and maintenance by ProTec, the industry leader in Alterrex support and services. The Air-Bridge 2000 ™ will easily bolt up to the existing bus work in the rectifier cabinet. *RTD relays can be changed to RTD transmitters for monitoring of heat sink temperatures.